"Watermelon tomato salad, nice refreshing salad and the kids love it...this is a great summertime side." 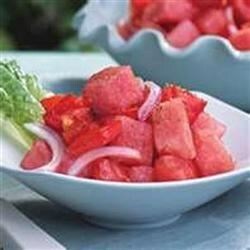 Place watermelon cubes, tomato, sweet onion, and green onion into a salad bowl. In a separate bowl, whisk together the balsamic vinegar, olive oil, and sweetener until the sweetener has dissolved. Pour the dressing over the salad, and lightly toss; sprinkle with salt and black pepper to taste. See how to make a sensational summer salad. So refreshing! I haven't made this but my friend did and it was AWESOME!! Don't let the watermelon/tomato/onion combo discourage you, it's sooo good!! Really good!! I added cilantro and little lime juice and it was amazing, my kids love it.